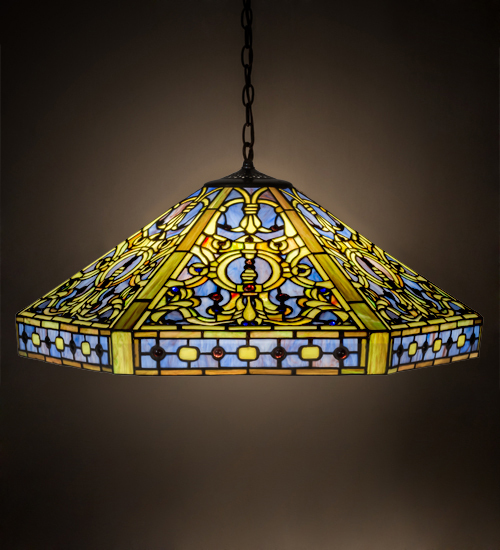 Description: The elegant Elizabethan pendant recreates Louis Comfort Tiffany's original pattern inspired by stained glass used in castles and cathedrals throughout Europe and in German and Flemish ornamentation. These motifs complement a fanciful interlaced mosaic design with rich hues of Moss Green and Sunburst art glass, accented with Red, Blue and Purple jewels and banded with mottled Violet art glass. The hardware features a warm Mahogany Bronze hand applied finish. Custom colors, styles, sizes, and dimmable energy efficient lamping options such as LEDs, are available. The fixture is UL and cUL listed for dry locations.